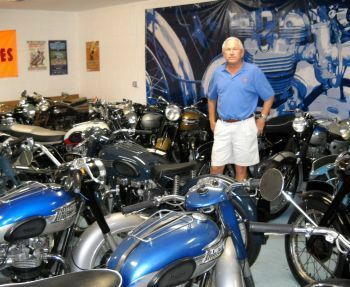 Bud Ekins may have done more than any other single individual to make young Americans fall in love with the Triumph brand. His larger than life achievements aboard the marque in both Europe and America created an aura of romance and adventure around the marque that undoubtedly sold countless numbers of the British twins. Ekins won the Catalina Grand Prix, the Big Bear Run three times, earned gold medals at the International Six Days trial, became the first America to earn a point in world championship scrambles competition, and was ranked first in Southern California competition seven times. Many of his achievements were aboard Triumph twins, as was his famous stunt-double jump for Steve McQueen in "The Great Escape." His running crew included the likes of Keenan Wynn and McQueen, who were often seen hanging at his shop. Mike Crone was born in the San Fernando Valley in 1946 and spent his impressionable teenage years hanging out at the Ekins dealership, listening to the sounds of Triumph twins and the war stories of Ekins' Hollywood buddies. He recalls, "In addition to the new Triumphs in the showroom, Ekins had rows and rows of antique motorcycles, many of which he had brought back from England. Undoubtedly, this is where I got my love of Triumphs, but I think it is also where I got the idea that a motorcycle is a collectible, worth protecting and preserving. Crone began riding a Triumph in high school, and after graduation he earned a degree in landscape architecture at California Polytechnic at Pomona. With the boom in popularity of golf in the 1970s, Crone began to supplement his landscape architecture work with golf course design and construction, and by the 1980s it had become a full time business. Since then, the work has taken him to Texas, Tennessee, North Carolina, and finally to Florida, where he resides today. 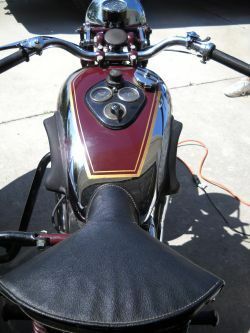 The lucrative nature of golf course construction also enabled Crone to take a look at motorcycles as investments and collectibles, and in the 1980s he bought his first collectible bike. No surprise that it was a 1968 T100C Triumph. Interestingly, building golf courses also led Crone into another area of collecting. He explains, "A golf course's demand for water often dictates construction near rivers or lakes, and this is where Native Americans established their villages. When we began moving earth for a golf course, it was not unusual to find arrowheads, spear points, and other stone tools. I was amazed at the quantity that were out there, and I developed an admiring respect for the artistry, craftsmanship, and skilled labor that went into each and every one of them." Today, Crone is an expert on Native American artifacts and has a collection that rivals his motorcycles for quality and value. As for his motorcycle collection, Crone relates with a smile, "It was slow and steady for awhile. Over the first twenty years, I accumulated about 20 Triumphs, but around 1995 things kind of got out of hand." He continues, "British bikes were really coming into their own among American collectors. I set myself a goal to get at least one example of each year of the Speed Twins and Thunderbirds, and I went after them with a vengeance." The pursuit resulted in many duplicates, it branched out into TR6s, and finally an example of every year of the T110. 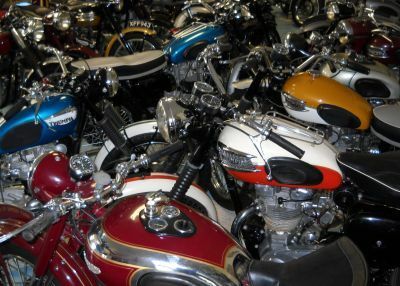 Today, in Mike Crone's garage are 55 Triumph, and in other storage areas are about 40 more of the Meriden twins. With so many Triumphs, Crone explains, "I have begun to sell off post-war duplicates and look for pre-war models." 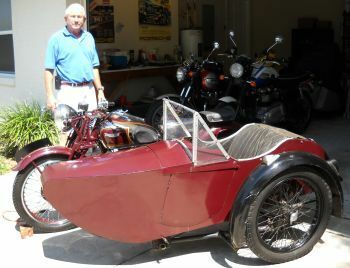 His current pride and joy is an original 1938 Speed twin with 1945 Watsonian sidecar, and his holy grail is a 1939 Tiger at a reasonable price. He also has a 1945 Speed Twin, which he explains, " . . .is very rare because so few were built that year when civilian production resumed after the war. No one even knows how many were built." Crone has won many awards with his Triumphs, and publishers often call upon him to allow his machines to be photographed for calendars. An especially notable achievement came in 2009 when his Thunder Blue 1950 Thunderbird won best of show at the Riding into History Concours d'Elegance. Today, standing in a sea of Triumphs, Crone remarks, "It is a very fulfilling hobby, but it is also an investment. I did not collect these motorcycles to turn over and make money. I do it for the enjoyment. Still, some of them will undoubtedly be sold as I move into my retirement years. But I don't think I'll ever sell them off. I may cull the herd, but I'll always be looking for rare and special examples to add to the collection." After an afternoon of exploring and talking with Mike Crone about his collection, one cannot help but note conspicuous omissions among the marque. There are no singles; there are no triples; there are only twins. It would appear that having "Triumph" on the gas tank is not enough to satisfy Mike Crone. He is touched exclusively by the direct descendants of the singular genius of Edward Turner; the Speed Twin that evolved into the iconic design of British motorcycles. And we can't help but think that in his love for the twins, the shadow of the hand of Bud Ekins still spreads across Mike Crone's collection. Check out the Triumph historical time line, or this video of Triumph motorcycle history. Editor's Note: This story was originally published at Motohistory.net on April 28, 2011.